A bathroom is a place that reflects your personality, so it needs to be properly renovated. The modern-day calls for more spacious washrooms. Your washroom not only increases the quality of the interiors of your house but also improves your bathing experience. A good bathroom increases your social prestige. Normally bathroom renovations are made when your house is too old. Old houses have a tendency of having very less bathroom area. Thus, the need for a bigger bathroom calls for bathroom renovations. However, there are tips to remember before you renovate your bathroom. You can modify your bathrooms according to your need and specific preferences. Careful Planning: Do not randomly start your bathroom remodeling. You should always treat your bathroom renovation like a new business venture or a project that you need a blueprint for. Thus, before you select the hue for your tiles and wall paints for your bathroom renovation you need to check out everything very carefully. Also, you should make a vague idea of how aesthetic you want your washroom to look. 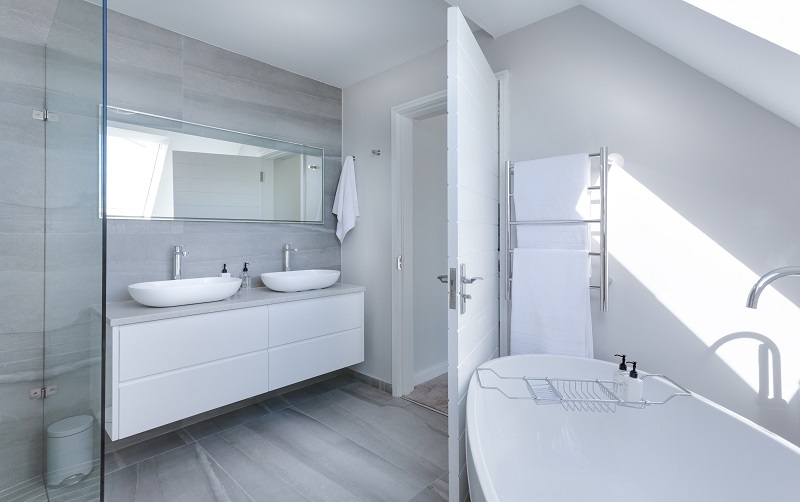 Different types of living conditions require different kinds of bathroom remodeling. For instance, a bathroom that is used by all family members requires building materials that are rather robust and durable. Choose A Layout That Conceals Your Toilet: To increase the visual and aesthetic appeal of your living space, remodel your bathroom to conceal it by the addition of a door, vanity space or wall that can hide away your toilet from glaring public view. If these complicate your budget estimations, you can use a shelving or some sort of a hutch, that does the trick while remaining cost-effective. Install Fixtures That Help You Save Water Bills: It is crucial to install fixtures that are water-efficient, in their essence. These items require daily usage and it is a good one-time investment to a secure and long-term plan. Invest and include it in your budget for long-term benefits. Play With The Lighting: The presence of lighting in a room can literally make or break its appearance. A toilet has little natural lighting, but the presence of lighting is even more essential in this light deprived area. Use overhead lightening sources for adding brightness to the bathroom but you might decide against it, as they cast huge shadows. To reduce shadows, you can, however, use vertically positioned lighting sources. Remove A Tub, Add A Shower: While tubs are the things of a romantic getaway with yourself, they’re hard things you use daily unless you’re up for some extravaganza. Removing a tub you don’t use can actually free up a lot of space and in its stead; invest in numerous showers, as you can enjoy the splurge every day. Go Frameless: The frames and fixtures are the first things that go out of fashion very soon. Give your bathroom a timeless look, by having it frameless. It gives a modern aesthetic appeal besides, minimizing installation hardware levels. Same goes for flooring – pick something that’s durable and timeless. Maximize storage and space: If you have a bathroom that’s small, use tactics to make it appear to look spacious. Using pedestal sinks helps you save space than cabinets while doing the job all the same. Placing tower cabinets above towel racks are a great idea to maximize storage needs while working with less space. Begin Only When All Parts Have Arrived: While the excitement for a bathroom renovation is too much to wait, it is advisable to be patient for things that need shipping. If things haven’t arrived, wait or you’d be stuck with a half-renovated toilet, which is no good for use, for weeks.